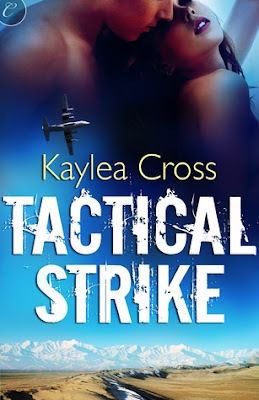 Kaylea Cross's Tactical Strike is a suspenseful romance that puts readers in the thick of military warfare. The second novel of the Bagram Special Ops series can probably be read without reading it's prequel, Deadly Descent. Tactical Strike focuses on Captain Candace "Ace" Bradford and Sergeant Ryan Wenworth. Cross is an excellent writer. Her attention to detail and the ability to make you feel like you're climbing a mountain during a blizzard, in the middle of battle, is done precisely so. The romance seems to fall behind the action, which isn't necessarily a negative element, but if you're not really fascinated by the war experience it'll make the story drag a little. The characters like Candace and Ryan are the kind you'd want to have your back when you're in a tight spot, loyal and dependable. At times Cross alludes to both characters having some kind of history in their lives that shaped their present attitudes, but I don't recall them ever explicitly talking about their pasts. Sure there were some statements that explained why Candace held herself apart from Ryan and why she was such a stickler for the rules, but I still felt like the story missed some pertinent personal information. Tactical Strike is a great novel to start with if you've never read military romance. The romance may not be extraordinarily different from what any romance reader is used to, but the military aspects that Cross uses to build the plot will open up the possibility of a new favorite genre.